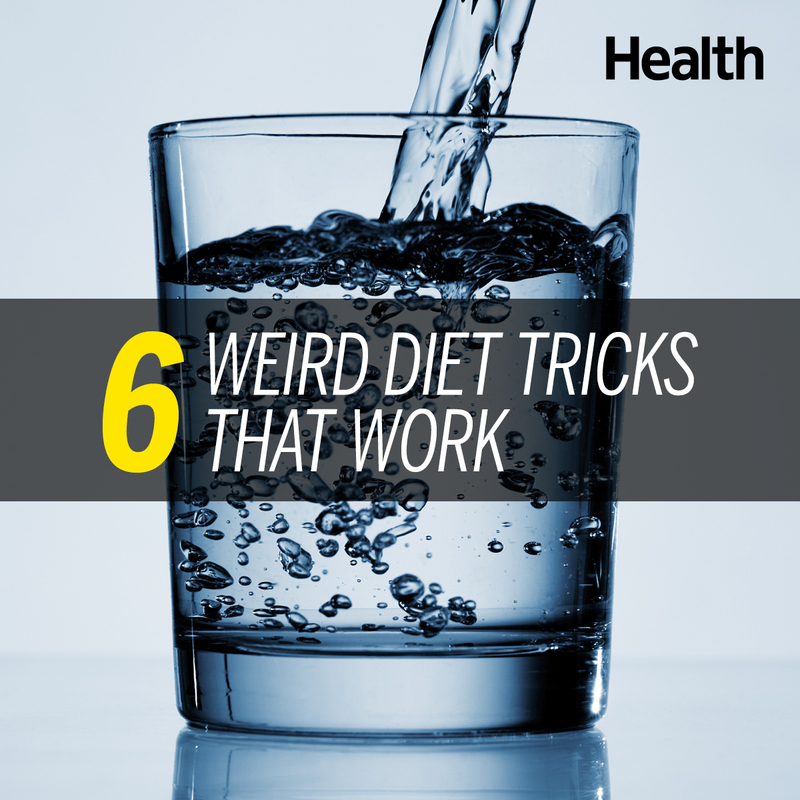 These tricks are just strange enough to work. Some clients come to me in search of a complete eating overhaul, including a meal plan with specific portions and recipes. Many others, however, simply want the shortcuts. While it's true that obtaining long-term weight loss success isn't that simple, I am happy to report there are several research-backed easy tricks that really do help. Add the tactics below to your daily habits, and you can cut calories, fight cravings, and ultimately, lose weight. This may just be the easiest, most cost-effective weight loss tip there is, and a new study published in the journal Obesity adds to its credibility. Researchers separated obese adults into two groups. The first was asked to drink 16 oz. of flat water (no bubbles), 30 minutes before meals, while the second was advised to imagine that they had a full stomach before eating. In the end, the volunteers who followed through with “pre-loading” with water before they ate lost about 9.5 pounds, compared to 1.75 pounds for those who didn't. The water group also shed on average three additional pounds, compared to the imagination group. Previous studies have shown that drinking a few cups of water before meals naturally results in eating fewer calories, and other research has shown that a 16-ounce dose of water upped metabolic rate by about 30% within 10 minutes. While the effect peaked 30 to 40 minutes later, those little bump ups in calorie burning can snowball meal after meal. Adding an item to your order as a way to cut calories might seem counter-intuitive, but it can slash your caloric intake for the whole meal. That's what happened when researchers had volunteers eat a low-calorie soup before lunch in an oft-cited 2007 study from the journal Appetite. In the end, participants reduced their total calorie intake at lunch (including both the soup and entree) by 20%, compared to when they didn’t eat soup. The reduction in calories also didn’t result in more hunger or less satisfaction. And if you’re thinking, “Soup in the hot summer, are you crazy? !” consider cold options. The study used soups that provided 100-150 calories per serving, and there are plenty of chilled choices that hit that mark, like gazpacho, curried zucchini, or borscht. Yep, you can think yourself slim. When scientists at the University of Birmingham asked volunteers to recall the same day’s lunch they found that those who could do so vividly ate fewer snacks later in the day. A group of volunteers was instructed to be mindful while they ate lunch by focusing on things like the look, aroma, and physical sensations of chewing and swallowing. The takeaway: as often as you can, eat without distractions, and if you feel a snack attack coming on, conjure up the memory of a previous meal. It may make the difference between eating one cookie or a handful. Cornell University scientists call them speed bumps, or stop signs, but you can also think of them as “evidence.” In one study, students whose tables weren't cleared, allowing them to see how many chicken wings they'd torn through via the number of bones left, ate fewer than those who had the remnants taken away. The same technique can be used for other foods, like olive pits, shrimp served with tails, pizza slices, if you leave the crust, or anything eaten off a stick. According to researchers an empty stick signals your brain to think “done” even if you’re not consciously aware of it. You can even create visuals that cue you to stop on your own, like putting popcorn into a small bowl rather than eating it straight from the bag (empty bowl=finished), or eating small cheese cubes off of toothpicks rather than on their own. Another Cornell study found that a greater contrast between the color of your food and the color of your plate may naturally help you to eat less. In the study, diners served themselves pasta from a buffet that included either tomato or Alfredo (white) sauce. Diners were randomly given red or white plates, so some had had contrasting colors—red sauce on a white plate—while others had matching colors. Those in the latter group served themselves 22% more than those who saw differing hues. While researchers aren’t totally sure why the color made such a big difference, aiming for contrast is another simple strategy to put to the test. It’s said that we eat with our eyes as well as our stomachs, but we also eat with our noses. One recent study published in the journal Flavour found that the stronger the smell, the smaller the bite. When volunteers had the ability to control their own dessert portions, those given more aromatic samples ate 5 to 10% less. Bottom line: scent plays a role in satisfaction, so take a moment or two to smell your food before you dive in, and add aromatic seasonings to meals, like fresh ginger, basil, cinnamon, or rosemary, to enhance the sensory experience. What’s your take on this topic? Chat with us on Twitter by mentioning @goodhealth and @CynthiaSass. Cynthia Sass is a nutritionist and registered dietitian with master’s degrees in both nutrition science and public health. Frequently seen on national TV, she’s Health’s contributing nutrition editor, and privately counsels clients in New York, Los Angeles, and long distance. Cynthia is currently the sports nutrition consultant to the New York Rangers NHL team and the New York Yankees MLB team, and is board certified as a specialist in sports dietetics. Cynthia is a three-time New York Times best-selling author, and her brand new book is Slim Down Now: Shed Pounds and Inches with Real Food, Real Fast. Connect with her on Facebook, Twitter and Pinterest.